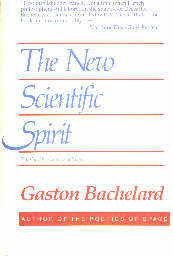 After a year or so of looking for Bachelard's works I came across this small paperback from Beacon Press. In this book the author, a famous historian of science and philosopher, outlines the tenets of an epistemology of scientific change which predated Tom Kuhn's "Structure of Scientific Revolutions" by 30 years. In one of those curious co-incidences of history, Bachelard died in 1962, the year of publication of Kuhn's epoch-making book. Although Bachelard laid the groundwork for a theory of paradigmatic changes in science, his book remained obscure and un-translated until after the Kuhn theory of paradigms. The ideas of Kuhn were to build on and embellish those of Bachelard - the most salient embellishment was the popularization of the word paradigm. Kuhn took the obscure word which meant "model" and used it to refer to the kind of world-shaking changes of the Newton and Einstein revolutions in science. It is aptly applied to the new chaos theory that emerged in the 1980's. Bachelard points out that the 2000 years of the unchanging geometry of Euclid was due more to the unchanging psychology of the human mind than to the power of the geometry. Each physical theory parallels a dynamism of the human mind that created it - the theory is the sole representation of the inner psychic change. The author debates the principles of rationalism and realism, determinism and non-determinism and decides that both sides of the dialectic arguments miss the point. The point, he says, is: when the dialectic gets hot and heavy, the likely reason is that it's time for a new level of understanding to emerge, i.e., a new paradigm (in Kuhn's words). The new paradigm will generate explanations that will resolve the difficulties on both sides in a new and unexpected fashion. And, that will occur in coincidence with a new mode of psychological processing. A mode that may discovered long after the new physical theories are in place. Thus we can expect to find psychologists discovering the modes of thought of quantum mechanics some 60 years after its heyday. A quick check of titles at the book store will confirm that that is happening today.